In 2018, Finland are 1st place, with most happy and satisfied people on the Earth. When I came from a small country to Finland, I was surprised. Wow, why are all such kind, good and sympathetic people here? There is absolutely no negative in them. Adults communicate with children very well and pleasantly. There are no aggressive people on the streets. Women themselves can get acquainted and talk. Do not compare with my country where a lot of aggressive people. A lot of emotional people ready to pour you dirt for some trifle. A lot of people climbing into a personal comfort zone and instructing you how to live and what to do in life, how to dress, how to look appropriate. And I began to wonder if it is possible to do it in Finland, absolutely in any country? Can! People will live better, more comfortable, safer and more pleasant. In order to adopt the Finnish experience of life, it is necessary to teach everything that is taught in schools in Finland and what their society is talking about, on what they are leveled. Fins say, we do not live separately - We build the country all together. Our people is a member of society, he is explained and socialized, he knows how this society works and what to do to be a normal citizen of this society. - Do not touch people. style of clothes, hairstyle, shoes. of people. In order to feel right away what you are doing and what is wrong, according to the smallest details of a person. To not be sick with you. That you were not bored ..
With you should be easy and smooth, without straining, without zadirok and stuff. If the child sits 6 hours in the computer, let it sit. This should not involve you at all. Do not be angry for the fact that he is sitting too long, and that he spends his days at the computer. Take it absolutely right. 11 am, let's get up, get up. Come on. Well, get up already, you're sleeping so long. Get up to her. " - Do not impose yourself on other people ..
sociable, positive and sociable. 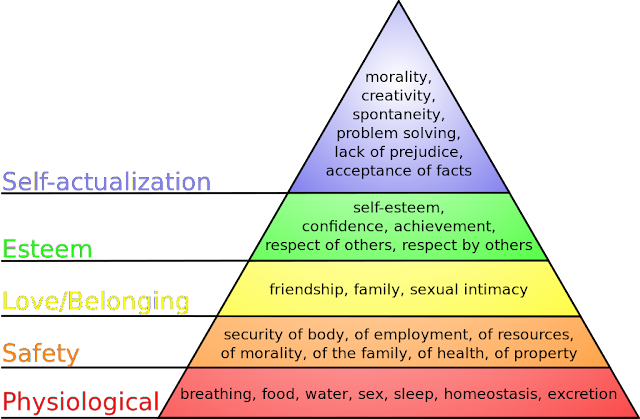 So that with you it was easy and good ..
And so, before us the Maslow table ..
We look, we study and analyze. And put ticks where you have in life and where not. A sense of security in your country or in your family. Do you feel protected? Confidence? Do you have confidence in yourself and yourself? By the way, if it's not there, it's possible because of your Environment that you can chafe and do not believe in your achievements. Comfort (is it comfortable for you at home and uvlas in the country, on the street, in the store, everywhere?) A good thing to analyze is not it? They say Russian guys when they go out into the street they frown. They do not like the situation around, everything is like would be enemies and not well-wishers, it is difficult for them, and they are not gloomy and do not smile. wither. So this is also normal. - To teach people to satisfy each other's needs, if this does not seriously hamper their comfort. Just listen. If a person says that you are pressing him, stop behaving so much because of what he feels this pressure. If you are told what they want you to do more often hugging your soul mate .. just do it more often, do not fight and do not ignore, learn to listen and to be responsive to the demands of different people. If you do not get something or you fall out of the comfort zone, just explain to the person that you do not conveniently, not habitually, or you do not cushion and do not like. Let's hope you will understand ..
- A man and a woman are respected by each other. They do not swear, and do not arrange a war of the sexes. In the relationship, mutual respect and consideration of needs and opinions of each other. - Women are taught to be normal, adequate and wealthy. They do not fence for them because they themselves can earn money. And in the family and in relationships there is an equal contribution in relations both in money and in other criteria. Woman must be responsible and adequate as well as man. - Children are respected. They are not spoken with high, try not to press, do not shout, and do not beat. Do not pressure on trifles. Try to develop cause-effect relationships, and the adequacy of children, so that if the child something broke it, he realized that he had broken an expensive thing without whipping and screaming. You ask, but how to develop children and generally influence them? All people must feel simple and perfect in the country. - The Finns say "we do not steal." If somewhere the theft occurred and someone in someone else's foreclosure is almost always "Visitors". It's just propaganda but it's work. - Woman must be normal member of society. Independent and develop. Eat regularly on each other's personal space. - Problems in communication between men and women. War, conflicts and neponyatki each other. - People do not know what they want, and do not know how to say what they want. And if they say, others do not satisfy them. - Selective respect. Some are respected, others are despised. - Feeling of pressure in society. Children beat, do not respect, communicate with high. Constantly caring at small things. Communication of business owners to their subordinates is often tragic. DO NOT DO THIS. Make good atmosphere for everybody. People must feel simple and free on your job. Speak with they normaly, like with normal people. not like leader with subordinate. No negative in your communication.